Old World cobbled streets, top-class museums, an iconic Cathedral and a history spanning hundreds of years; York is perfect for a bit of culture as well as a great getaway! Meet a Viking if you dare! Come and join us for a change of scenery and a chance to get away to beautiful York for the weekend. Perhaps take tea in the late afternoon on the sun terrace at the hotel (weather permitting of course!) before meeting your host and fellow guests on Thursday evening for a welcome drink followed by dinner and a fun quiz. After breakfast, it’s time to head into the city for our morning guided walking tour. Discover the turbulent and fascinating history of York through the sights and tales told. View the City Walls, the famous Shambles and the imposing Clifford’s Tower. Originally built by William the Conqueror, it is all that remains of York Castle today, having once served as a prison and royal mint. 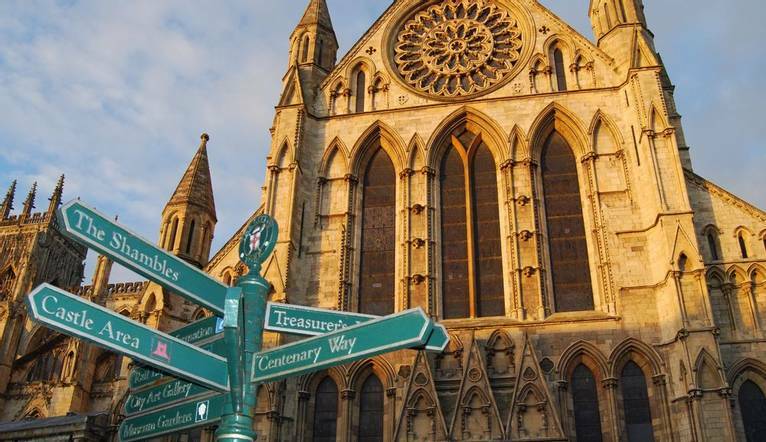 A visit wouldn’t be complete without seeing the stunning York Minster Cathedral; it’s the largest Gothic cathedral in Northern Europe and can be dated back to the 4th century. The rest of the day is yours to explore. Have lunch in one of the many cafés or a drink by the river before perhaps heading to The National Railway Museum? For something a little different, try the famous Jorvik Viking Centre. It’s a re-creation of the life led by the Viking invaders in York in AD867, complete with sounds and smells of the market and houses. Back at the hotel in the evening, meet up for pre-dinner drinks before heading out for dinner. Saturday morning is free to head back into York for some final sightseeing and shopping. Our new hotel is a collection of six historical, Grade II listed buildings in the centre of York City nestling in secluded courtyard gardens. Just a short stroll from the main attractions including the Minster, Jorvik Viking Centre, The Shambles and a host of shops and restaurants. Facilities here include a bar with comfy sofas, restaurant, 2 sun terraces and a gym. Please note there is no lift to the 1st floor bedrooms. All rooms are individually decorated and feature a TV, hairdryer, ironing facilities, tea/coffee making facilities with fresh milk, hairdryer and free Wi-Fi. From the M1 take the A19 exit towards York, at the roundabout, take the 1st exit onto A19. Continue straight onto A1036, Turn left onto Skeldergate then left onto Cromwell Rd. York station is less than a mile away. A morning guided walking tour is included of this beautiful city.